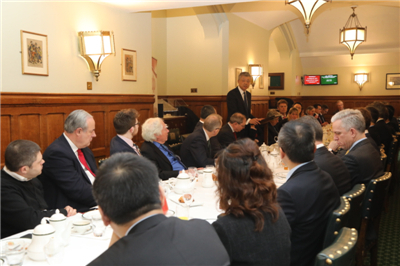 It is a real delight to join you again at the Conservative China Group breakfast. Today is the ninth day of the Year of the Pig. According to Chinese tradition, the festival is not over yet. Let me take this opportunity to wish you a happy and prosperous Year of the Pig! Pig has different symbolic meanings in different cultures. In the West, pig is associated with laziness and sloppiness. In China, pig symbolises wealth and fortune. But one westerner by the name of Winston Churchill said, "I like pigs. Dogs look up to us. Cats look down on us. Pigs treat us as equals." It seems that there are people in the West who like pigs. Our preconceived ideas may be wrong. This shows it is necessary to stay open and exchange ideas with others. Listening to both sides of a story makes people wise. 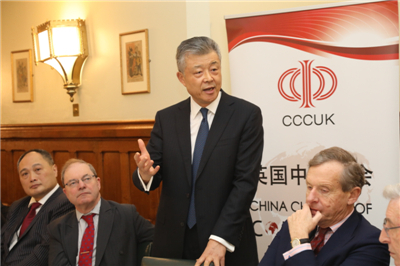 It is in this spirit that I would like to share with you my views on China-UK business cooperation and our relationship as a whole. First, bilateral trade reached a new stage. In 2018, China-UK trade in goods was $80.44 billion, exceeding $80 billion for the first time. British export to China reached $23.88 billion, increasing by 6.9% year on year, much higher than British GDP growth. and the UK was the third largest trading partner of China among all EU members. Second, two-way investment made new progress. In 2018, with its direct investment in China totalling $2.89 billion, the UK is China's fifth largest international investor and number one source of FDI in Europe. Chinese investment in the UK stood at $1.71 billion, increasing by 14% over the previous year. 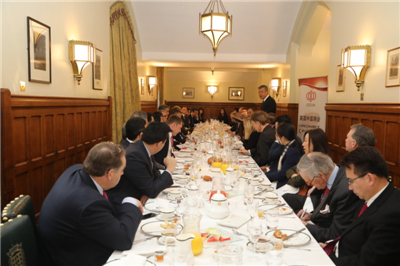 As of today, there are more than 500 Chinese companies in the UK, with a total accumulated investment of more than $20 billion. This is definitely one of the largest count of Chinese investment in Europe. Third, financial cooperation produced new highlights. London is the world's largest RMB offshore trading centre. Last year, RMB did well in London's foreign exchange trading. In October, dollar-yuan turn-over increased to $73 billion per day, overtaking pound-euro turn-over for the first time. China Re completed its 100% equity acquisition of Chaucer Holdings. China and the UK jointly announced the Green Investment Principles for the Belt and Road. Our cooperation on the Belt and Road Initiative has gone deeper and more substantial. The past year has seen numerous highlights in China-UK trade and economic cooperation. The new year will bring opportunities as well as challenges. I always think there are more opportunities than challenges. As long as we address the challenges properly, we can turn them into opportunities and take our cooperation to a new level. How does the UK see China's development? Does the UK see it an opportunity, a challenge, or even a threat? As we all know, China-UK relations have encountered some setbacks last year. Both China and the UK are working hard to bring our relations back to the right track. But how could this be possible if someone from the UK government keeps fanning "China threat" and talking about to sending a warship to the South China Sea to show off military power? This strikes the same note as the recent hyping-up of the so-called "security threat" of Chinese companies, and the clamour for a ban on companies such as Huawei. All these noises play on the same old tunes of the Cold-War mentality. What is the key to building the China-UK global comprehensive strategic partnership for the 21st century? First, we should choose win-win cooperation over Cold-War mentality. The Cold War was over several decades ago. But still, some people refuse to wake up. Their habit of drawing a line along ideology and social system seems to die hard. Take the South China Sea for example. and mutual trust between China and ASEAN countries has been enhanced. However, certain countries choose to turn a blind eye to the efforts of China and ASEAN countries. They continue to flex their military muscle in the South China Sea under the excuse of "freedom of navigation". They infringed upon China's sovereignty and undermined stability in the region. First, the freedom of navigation in the South China Sea has never been a problem. Every year, hundreds of thousands of merchant vessels pass through the South China Sea safely and unimpeded. There has never been a single case of navigation freedom being affected. Second, the efforts of China and other regional countries in maintaining peace and stability in the South China Sea should be respected. No more interference in the affairs of the South China Sea and no more damage to peace and stability in the region. With regard to Huawei, I want to stress that Huawei is an independent, private company. One should not assume that the Chinese Government or military has control over Huawei, let alone creating obstacles for Huawei's lawful business operation, just because it is a Chinese company and its founder is a Chinese veteran. 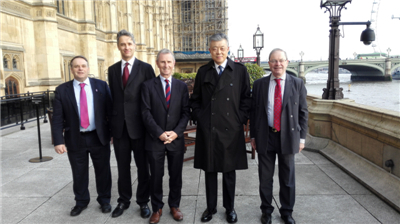 As far as I know, many Lords and MPs are veterans, including some friends of mine. Could we then claim that the UK Parliament is controlled by the British military? Should we really, as the old saying goes, "Give a dog an evil name and hang him"? Every country wants development and every country is running hard to get ahead. But one cannot run faster by disrupting or threatening others or by hanging onto historical burdens. In an age of globalisation, we should all work together and support each other in order to achieve common progress and create a brighter future. Second, we should choose open cooperation over closedness. History has taught us that open cooperation promises greater development. Attempting to obstruct lawful cooperation between companies goes against the trend of the times and flouts market rules. This would only be counterproductive. Both China and the UK have upheld, promoted and benefited from free trade and open economy. Take Huawei for example. Over the past 18 years, the company has benefited from its presence in the British market. At the same time, it has created job opportunities, paid tax and contributed to the development of UK's telecommunications industry. In the past five years, Huawei has brought £2 billion to Britain through investment and procurement and created over 7,500 jobs. Huawei has also pledged a further £3 billion in investment and procurement in the UK in the coming five years. This will boost the economic and social progress and IT application in this country. Against surging protectionism, it is all the more important that China and the UK promote connectivity and open cooperation, so as to build an open world economy. Third, we should choose inclusiveness over "zero-sum game". The fourth scientific and technological revolution is unfolding. The global industrial chain, supply chain, value chain and innovation chain are highly integrated. Anyone who sees the cooperation on science, technology and innovation as a "zero-sum game", and who believes that one man's gain is another's loss, would certainly end up missing the development opportunities. In recent years, Chinese companies have been learning from cutting edge technologies and enhancing their independent research, development and innovation. As a result, they have taken the lead in some areas, and have been working to promote the progress of the relevant technology and industries in the world. Huawei, for example, has leading telecommunications technology, especially in the area of 5G. It is providing network services for nearly 3 billion people in 170 countries and regions. This has been a positive contribution to the overall progress of the global telecommunications industry and the relevant technology. Now is the time for countries of the world to uphold inclusiveness, encourage healthy competition and engage in mutually-beneficial cooperation. Together, we can make science, technology and innovation work for everyone in the world. and the beginning of the China-UK "Golden Era". The "Golden Era" is not "mission accomplished". On the contrary, the "Golden Era" requires continuous hard work. As we are about to step into the third decade of the 21st century, I hope that both our two countries could cherish the hard-won momentum in China-UK relations and keep to the direction of the "Golden Era". We should resist outside interruptions, refrain from creating obstacles and enhance strategic mutual trust and deepen business cooperation. Together we will make the China-UK "Golden Era" more fruitful and sustainable!